This tutorial shows how to run an ANSYS HFSS simulation model in batch mode on Rescale&apos;s ScaleX platform. Once you are comfortable with the Rescale platform, you can tailor the workflow to suit your needs. For basics on Rescale batch, please refer to our guide. 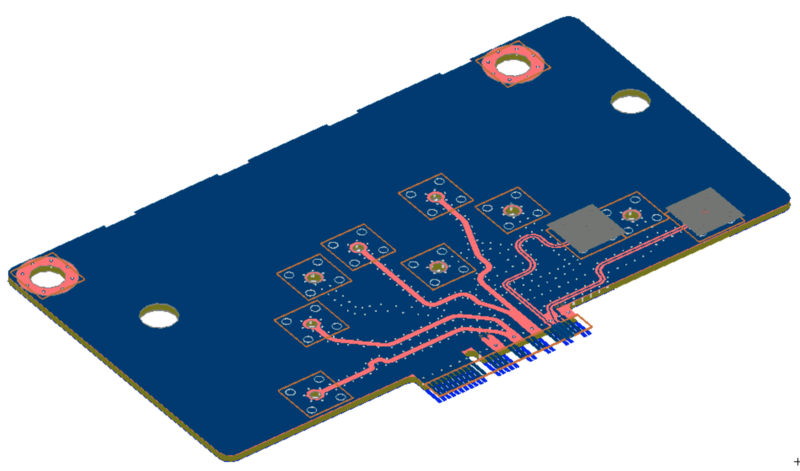 This tutorial is based on a cutout section of a PCI Express Gen 3 printed circuit board. The study is a single frequency sweep to calculate the S-parameters of the section edges. To obtain the files needed to follow this tutorial, click on the Job Setup link below and clone the job hosting the file. Next, click the Save icon to have a copy of the files in your Rescale cloud files. NOTE : Although you can run this job directly, to continue with this tutorial do not submit it directly. We are cloning the job in order to import the simulation input file ansys-hfss-electronics-example.aedtz into your account. You can also obtain the results of the job by clicking on Get Job Results. For running an ANSYS HFSS Job, we need to create a .aedtz archive file from the ANSYS Electronics desktop. You can create this file on your local ANSYS Electronics desktop. Rescale also offers the Remote Desktop option, where you can launch an ANSYS HFSS desktop to use the software as it&apos;s explained in the next section below. 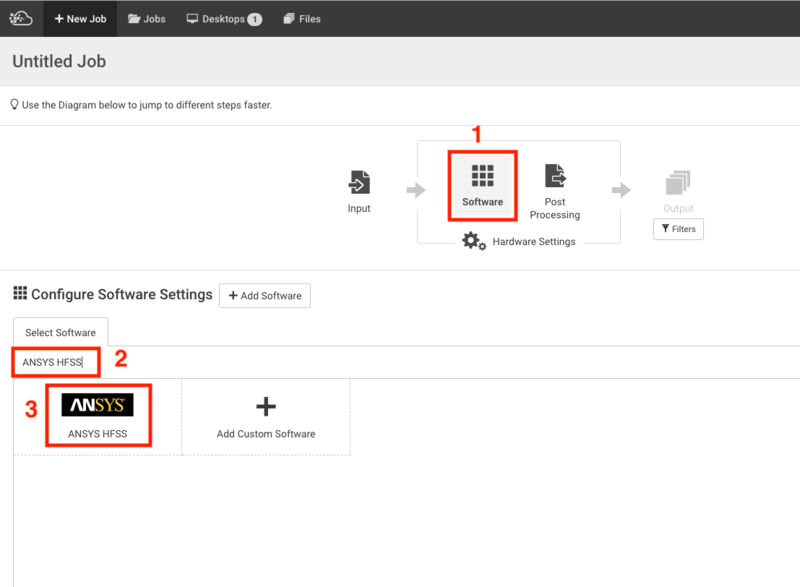 Start by selecting the Desktops option in the Rescale platform Web UI. Select New Custom Desktop button in the upper left hand corner. This should take you to the Desktop Configuration page. Give the Desktop a name. Here we&apos;ve named this desktop ANSYS HFSS Desktop. Under Choose Configuration, select the basic Windows configuration. Expand the drop-down menu for 1. Add Software. Search for or select from the menu: ANSYS HFSS Desktop. A Select License - ANSYS HFSS Desktop pop-up menu should now appear. Enter your appropriate ANSYS license information and click Ok to continue. You can now also select which version of HFSS you want to use. We will choose 2. 19.0 for this tutorial. Expand the drop-down menu for Add Jobs. Again, you can search for or select from the menu the job you cloned: ANSYS HFSS Tutorial. Click 3. Add under actions. You can then begin to launch the desktop by clicking on the Launch button in the lower right hand corner of the page. This should bring up a confirmation dialog. If the settings appear to be correct, click Launch in this menu to start the desktop server. This process should take approximately 5-10 minutes to spin up a new Windows server instance. Please refresh the page every few minutes to update the status of the server. In the Logs menu once the message Server(s) Started is reported the desktop should be ready to use. Click on the Connect button to bring up the connection options. You can choose to connect using your own Windows RDP client or an the In-Browser Desktop that we will use in this case. Please refer to our guide for more information about Windows RDP and/or configuring a Rescale Desktop. 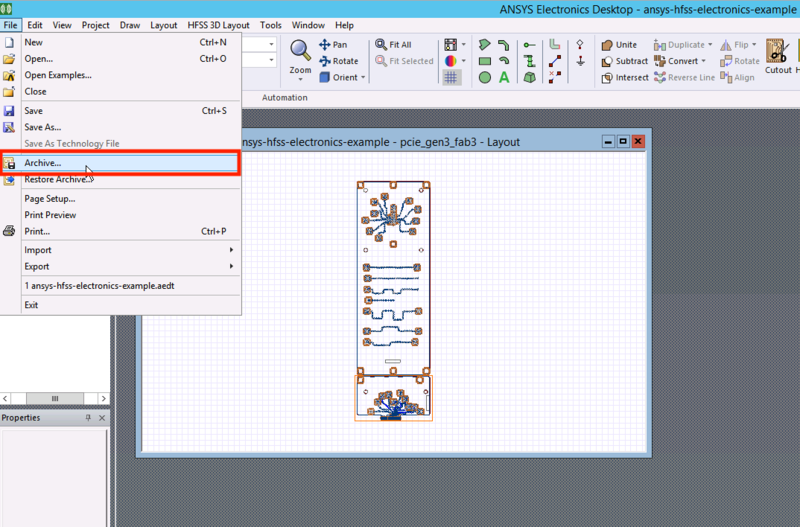 Once connected to the Windows desktop, launch ANSYS Electronics Desktop by double clicking the ANSYS Electronics Desktop 19.0 shortcut found on the desktop. If you attached the cloned job, in the File selection menu, navigate to the Desktop and select the attached_jobs shortcut. This should bring you to the folder that the attached clone job files were extracted to. Select the Input folder. Finally select the simulation file .aedt to open. If you want to use you own ANSYS HFSS file, you can upload the file to Rescale cloud and download it on the HFSS desktop you launched. Please refer to the File Transfer section for Uploading to Rescale Cloud Files and Downloading from Rescale Cloud Files. After you have made the necessary changes to your HFSS case file, click on File > Archive to create an archived input file. If you created the archived .aedtz file from a Rescale Desktop, you can now upload the file to Rescale by clicking on the Cloud Files icon on the desktop. Select the option to Upload from this computer. Navigate to the path of the file and select the newly archived .aedtz. If you created the archived simulation file from your local desktop environment, you can upload the file similarly from the Web UI Files option. Since we have prepared our simulation and uploaded the file back to the Rescale Cloud, we are done using our ANSYS Electronics GUI for the time being. We can now shutdown this Desktop instance. You can choose to keep the instance running to perform post-processing after the simulation is completed. In the Rescale Web UI, select Desktops. Check the Select tickbox under your Desktop instance. This instance should be easily identified if you provided it a name earlier. Click the red Terminate button near the top of the page to shutdown this instance. This section will show how to submit the archived .aedtz that you created from ANSYS Electronics desktop. To start a new job, login to the the rescale platfrom and click on + New Job button on the top left corner. For more information on launching a basic job, please refer to the tutorial here. First, you need to include the input files needed for the batch run. For the ANSYS HFSS case, we need to include the .aedtz file which we created as shown in the previous section. If you created the file locally, you can use the Upload from this computer option. 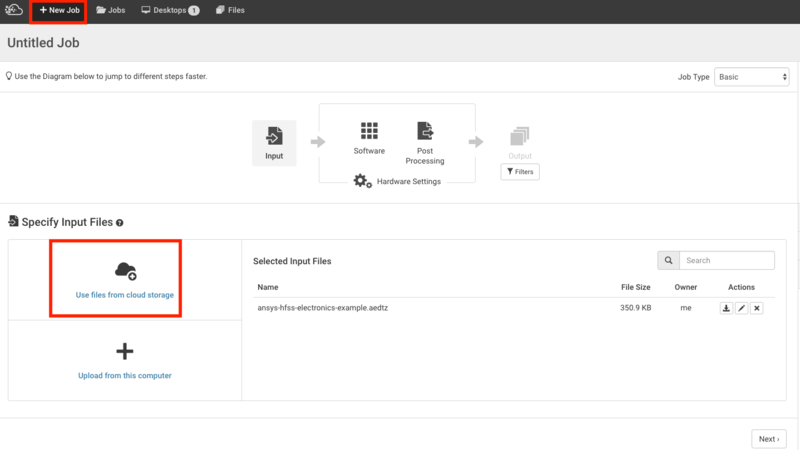 If you have the input file on the Rescale cloud, click on Use files from cloud storage and search for the file you created. After including the input files, click on software settings option. In the software settings page, search for ANSYS HFSS software and click on it. The Analysis Option window opens up where you can select the software version and edit the command to run a ANSYS HFSS batch job. In the command line, Replace the placeholder with your HFSS .aedtzfile. NOTE : If you are using HFSS with coretypes such as Mercury,Sunstone,Ferrite etc., additional settings to the command template need to be added. Please refer to the HFSS FAQs for additional command lines. You can also specify design options in HFSS. Please refer to the HFSS FAQs for more information about design options. If you don&apos;t wish to specify any design option, simply delete the < design-options > placeholder. Additionally, you can specify to distribute the tasks manually or automatically. Please refer to the HFSS FAQs for more information on manual vs automatic task distribution. In the hardware settings page, you can specify the core type and number of cores. For this example, we will choose the core type as Onyx and number of cores = 8. You can find a summary of the hardware on the right side of the jot setup page. There is no need to specify any Post Processing options for this tutorial. Additional Guide: Generally, HFSS workflows are very memory bound, so it is recommended to use high memory coretypes such as, Zinc or Melanite for your workflows. If you discover that during frequency sweeps the memory usage is low, then switch to a lower memory coretype such as Onyx or Emerald. After reviewing your selections, your case should now be ready for batch submission at this point. Click the blue Submit button in the top right corner on any of the job configuration pages or in the middle of the Review page. Alternatively, instead of submitting the job, you can elect to Save the problem setup to be run at some later time. A guide on Monitoring Status on Rescale can be found here. Once the job has completed its run, you can Download all of the output files from the Results page. You can also launch another Desktop and attach this job to perform post-processing. A guide on Managing your Job Results on Rescale can be found here. When you attach the completed job, Rescale will create two folders - input and run1 inside the desktop > attached_job > [job folder] folder. 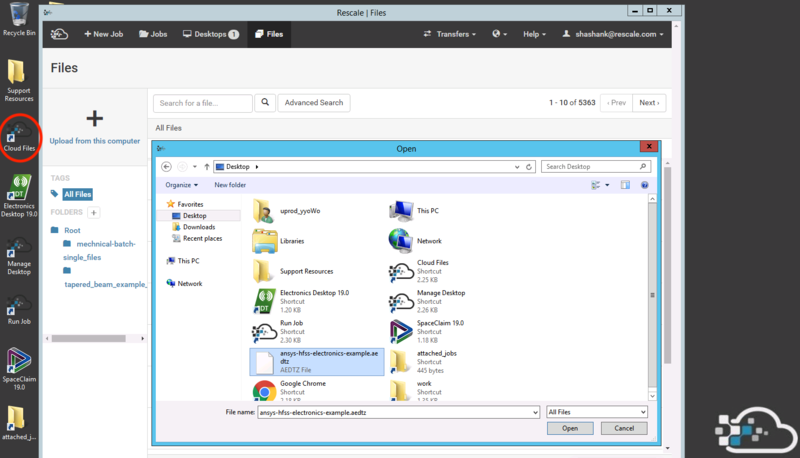 The run1 has three folder with the extensions - .aedb , .aedt.batchinfo and .aedtresults. It additionally has a .aedt file as well. To view the results, open ANSYS Electronics desktop and open the .aedt file inside the run1 folder. The results will automatically be loaded into ANSYS Electronics desktop. You can proceed to post process on the software.